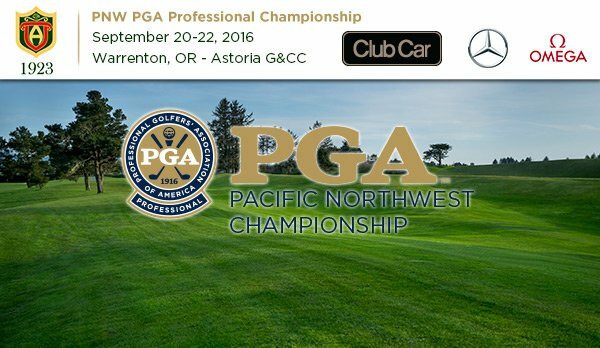 National is now accepting entries for the PNW PGA Professional Championship at Astoria G&CC on September 20-22, 2016. The entry deadline is Wednesday, September 7 at 11:59 PM. You may register for this event through PGA of America Membership services at 800-474-2776, www.pga.org or www.pgatournaments.com. Please pay attention to the 11:59 PM entry deadline for this event! This championship confers the title of “The Pacific Northwest Section Champion”. It is the most important and elite PNW PGA tournament of the season. Eligibility: You must be employed in one of the following classifications as of August 31 to be eligible to play in the PNW PGA Professional Championship: MP, A-1, A-2, A-4, A-5, A-6, A-7, A-8, A-9, A-10, A-11, A-12, A-13, A-14, A-15, A-16, A-17, A-18, A-19, A-20, A-21, A-22, A-23, A-24, LMA and LMMA. Advancement: The top seven finishers in our PNW PGA Professional Championship will advance directly to the 50th PGA Professional Championship, supported by Club Car, Mercedes-Benz USA and OMEGA, held at the PNW’s very own Sunriver Resort’s Crosswater and Meadows courses, Sunriver, Oregon on June 17-21, 2017. That’s right! We are playing for spots to advance to the National Championship held within our own Section next June! Additionally, the low 20 scores at the 2017 PGA Professional Championship will earn a place in the 99th PGA Championship. The PNW PGA Professional Championship will be held at the beautiful Astoria G&CC in Warrenton, Oregon on September 20-22, 2016. Host PGA Professional John Kawasoe and his staff are excited to host this year’s championship. Some of you may have taken the opportunity to play at Astoria G&CC last year in our 2015 PNW PGA Pro-Amateur Championship, and get a little practice in. The Section Championship dates back to 1934, with Verne Torfin winning the title at Fircrest GC. In 2000, the Pacific Northwest PGA Championship merged with the Section CPC to create one great tournament experience, with the top finishers going on to compete at the National PGA Championship. Only open to Section Professionals, this event draws the strongest field of PGA members in the Northwest. Last year, PGA Professional Tim Feenstra of Broadmoor GC came from five strokes behind PGA Professional Brian Thornton of Meridian Valley CC to win his third Pacific Northwest PGA Professional Championship. Feenstra had six birdies on his way to his 6-under par 66 to force Thornton into a playoff. On the first hole of the playoff, Feenstra birdied to win after Thornton’s birdie putt narrowly missed. Feenstra had previously won this event back in 2011 at Illahe Hills CC and 2013 at Meadow Springs CC. Last year, eight professionals advanced to the 49th PGA Professional Championship June 26 – June 29, 2016, at Turning Stone Resorts– Atunyote and Shenendoah Course – in Verona, NY. Watch these eight players this June: Tim Feenstra of Broadmoor GC, Brian Thornton of Meridian Valley CC, Clint Ables of Tri-City CC, Brian Nosler of Golf in the Pearl, Tony Robydek of Pro Golf Discount – Tacoma, Jason Aichele of Meadow Springs CC, Ryan Malby of Iron Horse GC and Jason Pitt of Chewelah G&CC. For the complete list of PNW PGA Professional Champions, click here to visit the PNW PGA historical site. New this year, we already know how many spots our professionals will be playing for. To come up with the number, PGA of America calculated spots for our Championship based upon a 5-year average of the actual number of players to start their respective Championships. Also, sponsorship dollars for the Section PGA Professional Championship were calculated using the same 5-year average. We are playing for seven spots this year. CLICK HERE for the PNW PGA Professional Championship flyer. Show it to your bosses to remind them that you need time off, or give a copy to your fellow professionals to encourage them to compete. Also note, the PGA of America has adopted the condition of competition for Grooves and/or Punch Marks at the Section level of the Pacific Northwest PGA Professional Championship. ALL PLAYERS MUST comply with this condition of competition. And while you are in town to enjoy this amazing course and tournament, you may want to enjoy some of the fun, unique things to do around Astoria. Fort George Brewery offers over 40 varieties of beer to try, in another historic Astoria building.